As the largest court reporting firm based in Southwest Ohio, our experienced and credentialed reporters can handle any legal proceeding. Multiple conference locations in and around Cincinnati, Dayton and Columbus, Ohio. All have videoconferencing capabilities. As a pioneer in the field of legal video, our wide array of videography services are custom-tailored to meet your individual needs. Need assistance issuing and serving the necessary legal documents including subpoenas, summons, complaints, writs and 180 day letters? Videoconferencing is an efficient solution for you to make fast decisions, save travel time, save cost and maximize productivity. Schedule court reporters, videographers, conference rooms and subpoenas anywhere in the nation. Make one call - we take care of the rest. Cincinnati locations include downtown, suburbs, and in Northern Kentucky near the Cincinnati airport. Columbus locations are conveniently downtown, in the suburbs, and right by the Columbus airport. Our Dayton office and headquarters is downtown, easily accessible to I-75 and convenient to the airport. 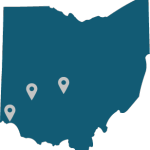 Mike Mobley Reporting has provided court reporters and court reporting services across the southwestern Ohio region since 1979. For 40 years, we have pioneered the use of new court reporting technologies such as e-transcripts, real-time transcription, video depositions & more. We continue our commitment to delivering the highest quality court reporting service possible. As part of that promise, we continue to open additional Ohio court reporting service locations, to ensure that our comprehensive suite of services stands at the ready.